On a Sunday in February, Lydia, 19, and her three little sisters were on their way to their grandmother’s home in Gatineau. The mood was cheerful in the car as the four sisters sang to songs on the radio. As they were walking in their grandmother’s apartment building the youngest one of the four sisters, Madeleine, suddenly collapsed. At first, Lydia thought Madeleine was playing a joke on her. She picked up her little sister and realized that her legs were heavy and that her face was pale and unresponsive. Lydia carried her sister to the lobby and laid her down, while her two younger sisters ran inside for help. Quickly, Lydia checked for breathing and realized her sister’s breathing had stopped. “I lifted her chin up and moved her tongue out of the airway.” She called 9-1-1 and started doing compressions until the arrival of the paramedics. In a matter of minutes, the police and the firefighters arrived and administered three shocks to Madeleine with their defibrillator. Shortly after, Madeleine was transported to the hospital by the paramedics. 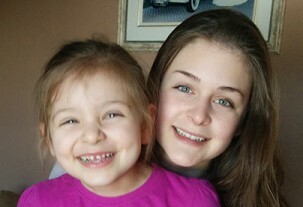 In the evening, Lydia received the news that her little sister survived a cardiac arrest. After spending a whole month in the hospital, the five year old was out without any permanent damage. “The doctor told me that if I wouldn’t have reacted so quickly, my sister wouldn’t be with us today,” shares Lydia. Ever since the incident, the two sisters are closer than ever. “We never know when a medical emergency could happen. It could happen at a family gathering, a sports activity, on the street, at work, and even at their school. There are many undiagnosed cases of heart disease. It is very important for students to learn CPR and to learn it as part of their school curriculum,” says Lydia and Madeleine’s father, Luc. “If I wouldn’t have received the training mannequins, this five year old little girl may have not been with us today because I wouldn’t have been able to give the training.” tells teacher, Dominique. The ACT High school CPR program was set up in 2011 in École secondaire du Versant, Gatineau, Quebec, thanks to the support of the Government of Quebec, and ACT’s national health partners, AstraZeneca Canada, Pfizer Canada and Sanofi Canada. The Advanced Coronary Treatment (ACT) Foundation is the award-winning, national charitable organization establishing free CPR and defibrillator training programs in high schools across Canada. ACT raises funds to donate mannequins and teacher training to schools, and guides schools in program set-up and long-term sustainability. More than 2.9 million youth have been trained in CPR by their teachers through this lifesaving program to date.